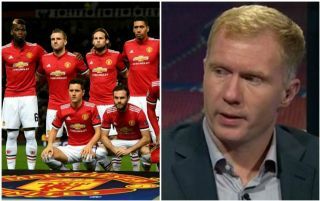 Manchester United legend Paul Scholes has suggested Jose Mourinho needs to change his management style with two of the club’s most talented young players in Anthony Martial and Marcus Rashford. The Portuguese tactician hasn’t always been willing to give the pair a great deal of playing time from the start of games, and they notably failed to impress in the recent defeat to Brighton. Scholes believes Mourinho handled their performances badly in the wake of that defeat, and seems concerned that the Red Devils boss could run the risk of losing them. It could even be that Mourinho plans to offload Martial anyway, with various recent transfer rumours suggesting he’s one who could be on his way out of Old Trafford this summer. The Sun have reported United could cash in on Martial and other first-team players this summer, and for some this will be worryingly reminiscent of when Mourinho let the likes of Mohamed Salah and Kevin De Bruyne leave Chelsea at a young age before they went on to shine elsewhere. It does increasingly seem in the modern game that Mourinho’s approach only risks alienating players and failing to get the best out of them before they ultimately move on to play under a manager who will treat them better. This seems to be playing on Scholes’ mind, as he told talkSPORT: ‘It’s a little bit worrying, especially the comment after the Brighton game. ‘These young players need an arm around them these days, they need a bit of love at times and they aren’t really getting that. Would they improve if they get that? I hope that they would. ‘I know they’re good players, they’re really talented players.